Elvis is a 1979 American television biographical film directed by John Carpenter. 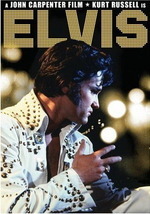 It is based upon the life of Elvis Presley, and stars Kurt Russell in the title role. It stars Shelley Winters, Season Hubley, Bing Russell and Pat Hingle in supporting roles. Elvis originally aired on ABC. Russell was nominated for an Emmy Award for his performance as Elvis. Also nominated for Emmy Awards were cinematographer Donald M. Morgan and make-up artist Marvin Westmore. Elvis is notable in Carpenter's career for two reasons. It was made after Halloween had wrapped, so it offered him an avenue to try his hand at a film away from the horror genre. It was also the first time Carpenter had worked with Kurt Russell, who became a frequent collaborator of Carpenter's. Russell subsequently starred in Escape from New York (1981), The Thing (1982), Big Trouble in Little China (1986), and Escape from L.A. (1996).